When it comes to The Twilight Saga, there are lovers and haters, but very few in between. Regardless of caliber, Twihards will flock to the theaters to catch the latest installment while the defiant will shun their dedication. This review of Eclipse will have little to no effect on whether or not those lovers or haters will see the film, but in the case of those caught in the middle, hopefully it’ll persuade them to join the former – at least this time around. Moody Bella (Kristen Stewart) is long gone and now our leading lady is back with her brooding bloodsucking boy, happy and, most importantly, far more confident in herself. Graduation is right around the corner and so is the day she’s longed for, the day Edward (Robert Pattinson) turns her into a vampire. The only thing Edward asks for Bella in return? For her to let him make her his forever by marrying her. While Bella and Edward are negotiating their I dos, Jacob (Taylor Lautner) is trying to maintain his position in the love triangle. Even though Bella professes her love for Edward, Jacob is convinced she loves him too, but just won’t admit it. Back in 1973 George A. Romero gave us a taste of what it’d be like if a biological weapon were let loose on society in The Crazies. When someone comes in contact with Trixie they lose their minds and become violent. Think the army can save you from the madness? Think again. Not only are the military men just as afraid of contracting the virus, but they’re trying to protect themselves from the crazies too; basically, they’re willing to kill everyone and anyone not in a biohazard suit. 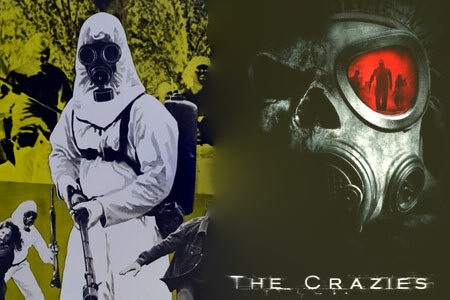 The Crazies is a film particularly fitting for the remake treatment. It’s dated, yet the general concept remains powerful. That’s where Breck Eisner comes in. He takes his source material trims away the fat and the obsolete elements and packs it with exactly what horror audiences are looking for: sheer terror. Eisner’s The Crazies is one of my favorite films of 2010, but I’m going to leave the critique at that and deliver this comparison using just the facts. However I can’t say the same for spoilers because they’re all over the place in this article, so beware. Too much of something is never okay. Whether it’s food, sleep or even exercise, overdosing leads to problems. Apparently the same is true for movies. There are loads of folks out there who are diehard Harry Potter, Lord of the Rings or Star Warsfans, but, according to an LA Times article, it’s an obsession with The Twilight Saga that’s most troublesome. Twilight lovers are sacrificing their relationship for Stephenie Meyer‘s books and the film adaptations. The general stereotype pegs teenage girls as being the main source of Twihards when, in fact, there’s hoards of Twilight moms and even grandmas out there. One fan, 31-year-old Chrystal Johnson revealed, “My husband finally came to me and said, ‘I think you love Twilight more than you love me. '” From there the couple separated and Johnson had to go through some major Twilight detox before being able to rebuild her relationship. A film starring Adam Sandler, Kevin James, Chris Rock, David Spade and Rob Schneider has to be funny, right? Not only is that what the promotional material for Grown Ups wants moviegoers to think, but it also seems to have been what was on the minds of the members of this comedic powerhouse. Sit back, relax, do what you’re told and hilarity magically ensues. Maybe in a dream, but this is a reality and Grown Ups faces a harsh one. Back in the 70’s coach Buzzer led Lenny, Eric, Kurt, Marcus and Rob to a basketball championship. Thirty years later, the boys have grown up and apart, but their coach’s passing brings them back together again not only to remember good old coach Buzzer, but to spend a weekend together at the same lake house at which they celebrated their big win back in the day. Joining them on the excursion are their wives and children. I’ve been defending The Heartbreak Kid ever since it hit theaters back in 2007, however, I didn’t feel comfortable putting my argument in writing until having seen the original film. I’ve come across a handful of reviews and a number of moviegoers who chastise the Farrelly brothers for not having stuck closer to the iconic source material. I thought that perhaps after having seen the 1972 version, I wouldn’t be as eager to sing the update’s praises, but what happened is actually the opposite; seeing the original only made me appreciate the newer version even more. For those out of the loop, The Heartbreak Kid, both the original and the Farrelly brother’s film, is about a guy who marries a wonderful girl only to learn about a few new quirks while on their honeymoon. Actually, that’s not all he discovers; our leading man finds a new girl, a better girl. Where the films veer in completely opposite directions is in the comedy. Think about past Farrelly films, the best and the worst. There’s Dumb and Dumber, There’s Something About Mary, Shallow Hal and more. What do all of these films have in common? The humor is outrageous and that’s exactly how The Heartbreak Kid remake was approached, which instantly differentiates from the original. In the wee hours of June 28th, 1969, it was business was as usual at the Stonewall Inn. The Mafia-run gay bar operated as a free zone for homosexuals in need of a place of refuge where they could just be themselves, hang out and, most notably, dance with each other, an activity that was forbidden everywhere else. With the mob paying off the police, facility operators were often tipped-off when a raid was about to occur and they usually happened in the early evening, when attendance was at a minimum. June 28th was a different story and that is the focus of the documentary Stonewall Uprising. A small team of police officers came in, the lights went out and not only were the patrons well aware of what was going down, but so were the crowds forming on the streets. As people began to emerge from the bar, the tension increased and the officers that initiated the raids were forced to barricade themselves inside the bar for protection. Eventually backup arrived, but so did more supporters. The riot lasted through the night and not only did it continue for the next two, but the events at Stonewall created a ripple effect that can be felt to this day. Tilda Swinton is as commanding in person as she is on screen. Her poise instantly attracts all attention and her passion for her work is overwhelmingly present in her answer to even the simplest question. However, there’s nothing simple about I Am Love. Not only has the project been in the works for over a decade, but the final product is oozing with a lavish and classical complexity we rarely see nowadays. The film stars Swinton as Emma, a Russian native who moves to Milan to be with her textile tycoon husband. She has three grown children and resides in a lush mansion run by a devoted wait staff, with a wardrobe filled with the finest fashion. Most would consider this a privilege, but in Emma’s case, it becomes more of a prison. With her children living their own lives and husband always working, she’s often left to herself. She has all of the riches in the world, but no one to share them with. That all changes when her son introduces her to his new friend, Antonio (Edoardo Gabbriellini), a chef, a man with the ability to rouse a powerful sensation within Emma through his tasty delicacies, as well his presence. I Am Love leaves the viewer with many questions and that’s exactly how the filmmakers wanted it. Everything from the message of the film to the characters’ fate is left to the moviegoer’s interpretation. But, of course, during our roundtable interview, Swinton was eager to elaborate on a range of topics including the inspiration for the piece, the thought put into the costume selection and much more.